July and August have seen steady progress on the frame structure, with our regular Monday working parties heavily engaged despite the indifferent weather. On the ground, the most visible signs of progress include the fitting of the buffer shanks, beautifully restored by Colin Williams and resplendent in Signal Red, all ready for next month’s Autumn Gala, but there is far more going on behind the scenes, both in the Bridgnorth workshops and in South Yorkshire. In-house work has continued on the two radial arm support stretchers and the two brackets for the flexible frame stay above the centre axle, while the cast firebox support bracket awaits its turn for machining and fitting. 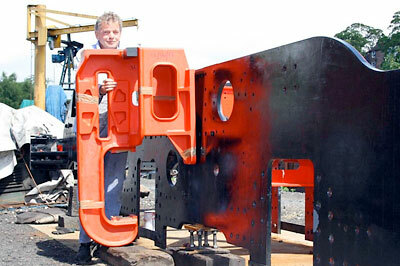 Away in South Yorkshire, work is proceeding rapidly on the machining of the cast horn guides and horn blocks; and also on the machining of the fabricated front and rear stretchers which fit on the inside of the buffer beams and support the pony truck pivot centres. We anticipate the return of all these items as a single consignment, and hope to drop the stretchers straight into the frames – having first needle-gunned the contact points in order to ensure a tight, sealed metal-to-metal fit - on their arrival at Bridgnorth, where space is at a premium. Once bolted into place, they will receive the painstaking attention of Colin and his gang with the white spirit and paint. The horns need not be mounted immediately, but will probably be fitted once the complete frame structure has been riveted in the Works. All this has delayed our placing of the order for the smokebox saddle, but it is hoped to contract Dave Hewson with this job by mid-autumn, with a view to having the frame assembly completed and ready for riveting by the SVR either at the end of this year or very early next. Brian Oldford has completed the very substantial patterns for the left-hand and right-hand motion brackets, and these are now resident at one of our Cheshire sub-sheds (to be precise, Chris Proudfoot’s garage - his long-suffering partner Jill has become resigned to its being a pattern store rather than being used for its intended purpose) awaiting casting as soon as funds permit. Barbara reports that membership stood at 280 by mid-August. While we have some really excellent supporters, this figure represents only about 2% of overall SVR membership, and we are convinced that we could, and should, be doing better than this. As we have concluded that by far the greatest proportion of support for 82045 is going to come from the SVR, efforts are being made to raise our physical profile on the line, and you should start to notice this over the ensuing months. At the autumn Gala (24-26th September), we will have a presence at Bridgnorth, Kidderminster and - for the first time – the Engine House, so hope to gain some new supporters over the three days of the event. Win a Footplate Ride - 82045 members only! As you may know, the 82045 Annual Raffle has for the past two years offered as first prize a round trip over the SVR on the footplate with Tony and Chris. This has proved to be an excellent fund-raiser, and will continue to be offered, though there is no restriction on those entering other than that they must be SVR members for the company’s insurance purposes. Barbara has decided to offer an additional chance to enjoy a footplate trip over the Valley, though this time we are limiting it to 82045 members, both existing and new. Names will be put in a hat and a draw held in the spring in good time for Tony and Chris’s footplate week. In order to be eligible, members – both new and existing - must be paying a monthly standing order of at least £5-00, plus of course all Lifetime members who have paid £350-00 will qualify. Please tell your friends about this new incentive – and, if you are an existing s/o contributor but for less than £5-00 per month (please understand that we are grateful to all our supporters! ), you might fancy upping it slightly in order to be eligible for entry into the new draw. Membership applications details and standing order forms are available on the How to Help page. We will be repeating the very popular and successful TOMBOLA at the SVR Autumn Gala. If you are able to donate a suitable tombola prize, it will be most welcome. 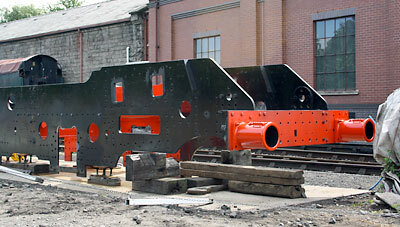 The engineering gang are usually at Bridgnorth on Mondays, and will be happy to take delivery of items. In addition, patternmaker Brian Oldford is at Bridgnorth most days and will also accept items at his pattern shop (behind the boiler shop in the container/workshop). Thank you! 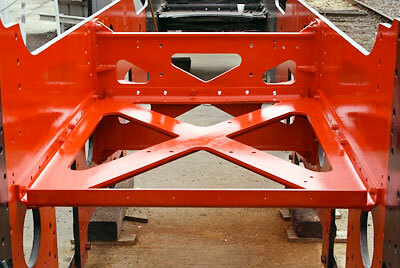 The newly cleaned and painted buffer shanks are now fitted. A close up of vertical and horizontal stretchers. Before it was taken away for storage, Tony took a photograph of Chris struggling to hold the left hand motion bracket roughly in position against the frames. Chris is over six feet tall, so this gives some idea of the scale of the item!